I once asked Dan Berrigan, the great American anti-war activist, for some advice to me in my life as a peace activist. He replied “Pray and Resist”. The world faces many interlocking crises in the areas of environmental degradation, public health, and terrorism, all of which are transboundary and require transnational solutions. Despite the fact that the issues are becoming increasingly global in nature, our consciousness is still trapped in the framework of nation and ethnicity. It is increasingly clear that this is a major obstacle to finding solutions to global problems. There is a need to generate global perspectives to solve transnational problems. This requires specific efforts to foster global citizenship consciousness in all of us. This project facilitates discussions and generates ideas around education for global citizenship, raises awareness of relevant efforts and initiatives around the world, and helps address imperatives such as peace, sustainable development and human rights within this framework. 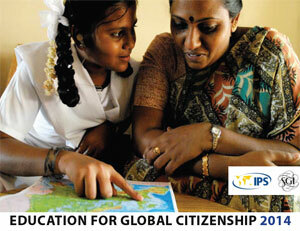 The project also supports ongoing international efforts, such as the United Nations Global Education First Initiative, while encouraging new approaches and helping to ensure that education for global citizenship is reflected in intergovernmental policy-making processes such as the Sustainable Development Goals and Post-2015 Development Agenda. This page includes independent IPS news coverage as part of a joint media project of the IPS-Inter Press Service global news agency and the lay Buddhist network Soka Gakkai International (SGI) aimed to promote a vision of global citizenship which has the potentiality to confront the global challenges calling for global solutions. Speakers: H.E. Ambassador Anwarul K. Chowdhury, Former Under-Secretary-General and High Representative of the UN; Ms. Vibeke Jensen, Director, UNESCO Liaison Office in NY Director, Secretariat of the Secretary-General's Global Education First Initiative; Mr. Hiro Sakurai Director, Soka Gakkai International; UN Liaison Office. Moderator: Ms. Ozioma Egwuonwu, New Future Foundation Founder, BurnBright International LLC.